Never lose orders and customers during the customer journey again! Tap a button and confirm, that's all you need to do to order, anywhere and anytime, even if you have unreliable network access. Customized to your needs and your history, you know that what is on offer is what you need. Place the button where you store your products. Now you are able to reorder instantly when you need it! Our quick and always reliable order flow reduces frustration and keeps your customers loyal. They will order more and more regularly. 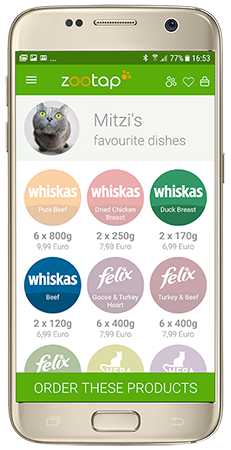 Customize buttons to suit your marketing strategy: linked to a brand, a single product or to a bespoke portfolio. Make your customers feel valued by giving them access to an additional, easy to use service which comes with no strings attached. Our buttons are pretty, too! Start here to use our E-Commerce Suite!